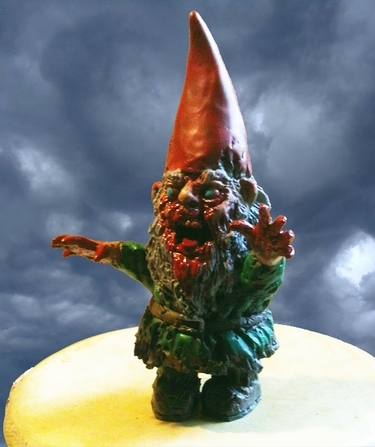 Part garden gnome, part reanimated dead body, this Green jacketed Mini Zombie Gnome is a unique and limited edition collectible version of our popular Full-Sized Gnombie Gnombie Zombie Gnome. Mini Gnombie is 6" in height and lovingly molded in polyresin with gruesome detail. His decay and details are air brushed. and finished with an array of lacquer coatings to keep some parts (clothing & hat) looking matte, while his eyes, mouth, and bloody beard and hands retain a glossy wet appearance. While Gnombie can be transported easily, left outdoors for a limited time, and photographed in the wild, for best longevity we recommend displaying this Mini Zombie indoors. He is equally terrifying whether displayed in the home or office. Mini Gnombie is created for ages 15 and up; he is not a toy and should be displayed for adult use only. Our Mini Zombies arrive to you in a foam cushioned collector box. Please open the box carefully - Mini Gnombie is horrifying at first sight and should be unpackaged with great care.